There were 2 surprising conclusions from my dissection. 1) There is oatmeal in the meat. 2) There are NO onions in the meat. Aside from that, one thing that I noticed was that the meat was pretty silky and gooey. It made me think that there was cream of mushroom soup or something in the mix, but there wasn't. I'll explain below. The other thing to notice about the meat is that it was broken up into very fine particles. I got pretty darn close with my attempt tonight. I got the color, texture and taste close enough that I couldn't tell the difference. Enjoy it in tacos or burritos or sanchos! I found an amazing video on preparing pad Thai. The video shows a lady on a boat in Thailand. On the boat she has a little gas powered burner, a wok and an assortment of ingredients. We have been long time fans of pad Thai. I wanted to make her exact version but I lacked a few ingredients. I couldn't find any tamarind sauce. I used to have a bottle but it got thrown out for the move. I couldn't find any palm sugar either. Also I don't like fish sauce. I made something similar last night to go with Hawaiian Pork Chops. Briefly saute garlic in oil. Add the red curry paste and cook for a couple minutes. Drop in the rest of the ingredients and simmer until sauce thickens. I also made some red tofu. To make that, cut firm tofu into chunks. Place in a bowl with a little water. Add a few drops of red food coloring and let soak until the pieces are nice and red. Heat peanut oil in a wok. Drop in tofu and fry briefly. Drop in 2 eggs and scramble. Add noodles and sauce. Stir until noodles are well coated. Next add half of your peanuts, half of the green onions, all of the chives and all of the red onions. Stir until well combined. Place into a bowl. To serve, top the noodles with the remaining bean sprouts, green onions and peanuts. Squeeze a little lime juice over the top. Serve a few lime slices with the noodles. It is perfect grilling weather in Iowa. The best pork on earth can be found in Iowa. Last night I bought big thick pork loin chops for $1.50 a piece! They were so tender and delicious it was unbelievable. Here is a good recipe to change things up a bit. Briefly saute garlic and ginger in oil. Add the rest of the ingredients and bring to a simmer. Simmer long enough to completely dissolve brown sugar. To grill the chops, mound all of the coals on one side of the grill. Sprinkle the chops with salt and pepper. Briefly sear the pork chops on each side over the hot coals. Move chops over to the side of the grill with no coals. Brush sauce on each side of each pork chop. Continue to grill on the cool side of the grill until chops reach an internal temperature of 160 degrees. Meanwhile, roast a couple red peppers on the grill over the hot coals. When the skins are blackened, remove the skins and cut into slices. Briefly grill a few slices of pineapple. Chop up a few cashews. To serve, put the pineapple slices on a platter. Place the pork chops on top of the pineapple. Top the chops with red pepper slices, chopped green onions and the cashews. We have been watching the TV show Dexter recently. There is a lot of Cuban food featured, because the show is set in Miami. When we went down the the Keys, we ate a ton of Cuban food. We liked it so much that we found a little cookbook in a gift shop called Cuban Home Cooking. Most of the recipes I have for Cuban food come from that book. Anyway Arroz con Pollo was mentioned in an episode of Dexter so we decided to make some up. I modified the recipe in Cuban Home Cooking just a tiny bit. Heat olive oil in a Dutch oven. Drop in chicken pieces and brown on all sides. Remove to a plate. Saute the onion, pepper, and garlic in the oil until soft. Add the diced tomato and cook for a couple minutes. Return the chicken to the pot. Add the wine, broth, cumin, organo, pepper and yellow food coloring or saffron. How much of the coloring is a matter of taste and judgment. It also depends on your particular brand of coloring. Bring to a boil. Reduce heat, cover, and simmer for 40 minutes. Next remove the chicken briefly. Add enough beer to the pot to make about 5 cups of liquid. Add the rice to the pot and stir. Bring to a boil. Return the chicken to the pot, reduce heat, cover and simmer until rice is tender. You may need to add more beer or water to the pot to get the rice right. When the rice is right, taste and add salt as needed. Stir in the green peas and cook until heated through. Serve on a plate with chicken on top of rice. Squeeze a little lemon juice over and serve with a fresh lemon slice on the side. Happy Cinco de Mayo! What is a scary mole? Well, I am the king of scary moles. A scary mole is one that is made correctly, with all kinds of flavor and spice, but served incorrectly to a Tex-Mex lover. Those big full flavored moles are not for the uninitiated. 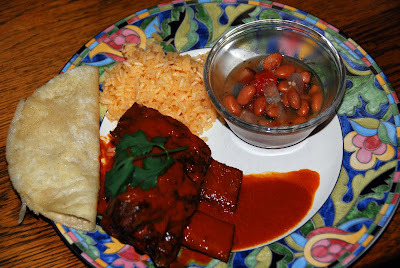 I decided to combine one of my favorite cooking methods, braising, with one of my favorite sauces - mole. You will need about 3 pounds of beef ribs. Have the butcher cut them in half if you can. 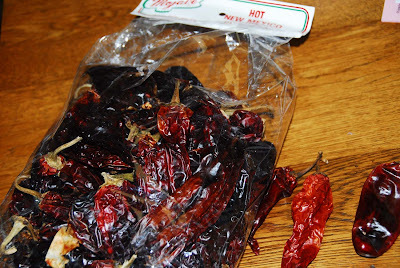 You will also need some dried New Mexico Chilies. These are red in color and milder than other chilies. You need to take the stems off the chilies and pull the seeds out. The place a layer of chilies, 1/2 of an onion, and a few cloves of garlic in the bottom of your braising vessel. Drop in a handful of peanuts. Add in 1/2 t oregano, 1 t cumin and 1/2 t pepper. Brown your ribs briefly and place on top of the chilies. Add water to almost cover the ribs. Place into a 275 degree oven with the lid of the vessel just barely cracked. Braise for 2 1/2 hours. 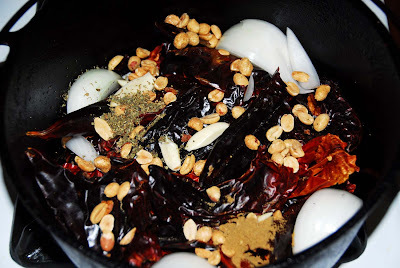 At the end of cooking take most of the chilies and place them into a blender. Add 1 cup of the cooking liquid and blend. Now add water, a little at a time, to make the sauce smoother and less thick. Remove the ribs from the pot and put on a plate. Clean the pot the rest of the way out and put the ribs back into the pot. Now take your sauce in the blender and strain it really well through one of those wire mesh strainers. This will remove all of the little particles of chili shell that didn't quite get softened and blended. Taste the sauce and adjust the salt as needed. Pour the sauce back into the pot with the ribs. At this point you need to put it back into the oven, covered, so that the sauce warms up. This is a good time to get everything ready to serve and eat appetizers etc.